Friday night I nearly always go out for dinner, and this Friday we went to Prickly Pear. I had not been there in quite some time. Because of the incredibly nice weather, I also wanted to go someplace downtown that would be conducive to strolling down Main Street. 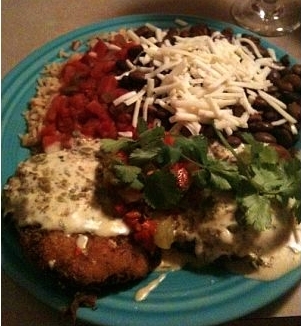 After a heaping bowl of hot tortilla chips and chunky salsa, I received my entree, Savory Crab Cakes, "with green chili chutney sauce; lump crabmeat cakes dusted with corn masa & pan fried topped with cheese sauce." The savory green chili chutney on top really made this dish. The crab cake wasn’t the most flavorful I’ve ever had, but I liked the southwest-"spin" on the crab cakes. The sides of southwest rice and beans were hearty and delicious. I loved this meal! 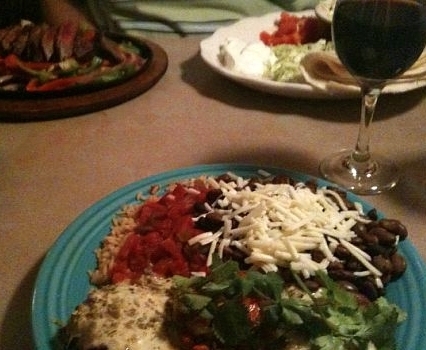 Below: Again pictures my crab cakes in front, with Tom’s steak fajitas in the background (and my Merlot!). I have been wanting to try one of the cupcake bakeries that have been popping up around town, so for dessert we strolled over to Cupcake Station, and each picked out two. 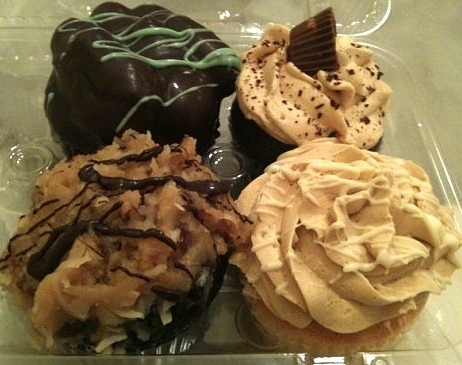 I picked out a chocolate mint one (top left) and Vanilla Latte (lower right), and the huz got PB&C (peanut butter and chocolate, upper right), and German Chocolate (lower left). Originally we were planning on bringing them home with us because we were SO full from dinner, but the smell in there is absolutely intoxicating and of COURSE I couldn’t wait, so we plopped ourselves down and each ate one. Tom had his PB&C, and I had my Vanilla Latte one which was BY FAR the BEST cupcake I’ve EVER had! Words cannot describe. Mmm. You could see the little vanilla bean pieces in the super moist cake part and latte icing was TO DIE FOR. We will definitely be returning to Cupcake Station! The staff were very nice too! Pingback: Washington DC biznass trip – Part I « Meg.Goes.Nom.Nom.